For a map of the park, please click here. There is no admission fee to visit the McCormick-Stillman Railroad Park. Tickets to ride the train and carousel are $2.00 each, with children two and under riding free. Children under the age of 13 also get free admittance to the Scottsdale Railroad Museum with a paying adult. The McCormick-Stillman Railroad Park accepts Cash, Checks, Visa, MasterCard, American Express and Discover as forms of payment. McCormick-Stillman Railroad Park is open 363 days per year (weather permitting), only closing on Thanksgiving and Christmas Day. Attraction hours vary seasonally. 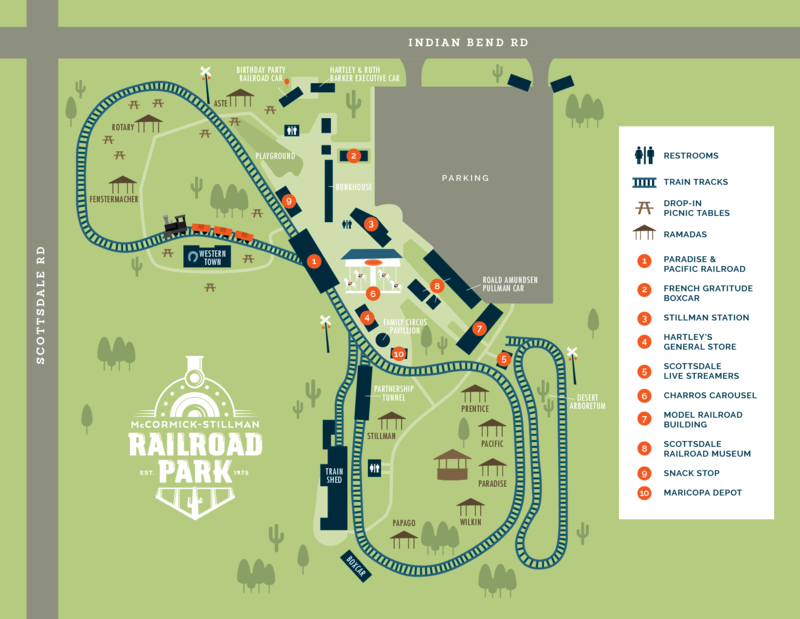 McCormick-Stillman Railroad Park is located at the southeast corner of Scottsdale Road and Indian Bend Road, 1.7 miles west of the Loop 101, exit Indian Bend Road/Talking Stick Way. Our address is 7301 E. Indian Bend Road, Scottsdale, Arizona 85250.